Use to prepare grapes or soft fruits for fermentation. Remove pits (i.e. peach) first. Not for hard fruit like apples. 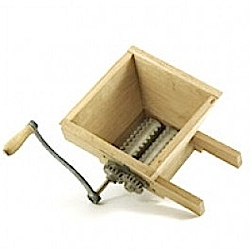 Wooden crusher with metal rollers (hopper 10" square). Sits perfectly atop most buckets. Makes fruit prep quick & easy -- handy to store between uses.